Just like in real life, the outskirts of publishing are pretty boring. Caveman no like watch friend get eat by dino. 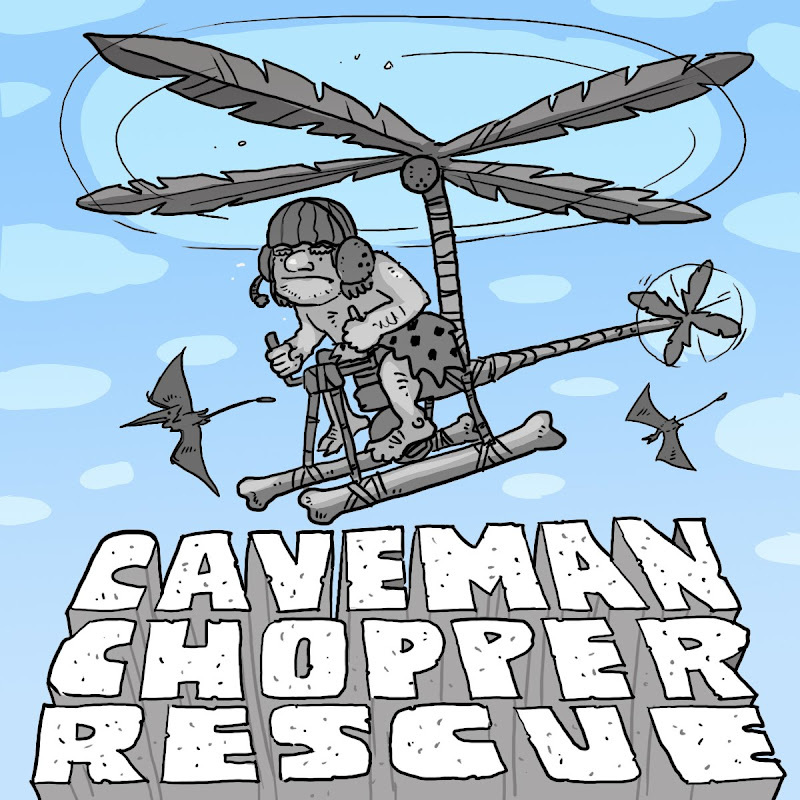 Caveman make chopper. Rescue friend from dino. Pretty self-explanatory. I love it when a caveman refers to himself in the first person as "Caveman," that makes me laugh. There is a whole new generation of children for whom a "Flintstone" is just a chewable vitamin. And I don't think anybody under 30 remembers Captain Caveman. I think the caveman is absent from the childhood entertainment landscape right now. I really like the caveman. Second, I finally performed "The Turtle Trick" in New Super Mario Bros. You know, where you bounce on the turtle on the stairs and get 99 extra lives. I could never do that in the original game--I tried SO hard as a kid. But I finally pulled it off in the new game. Big moment. It's pretty neat, in NSMB, if you have 99 lives, Mario loses his hat. For what it's worth, you've got 95 Google reader subscribers (including me), so that's at least 45 more people who are following your blog, even if they're not "following" it. 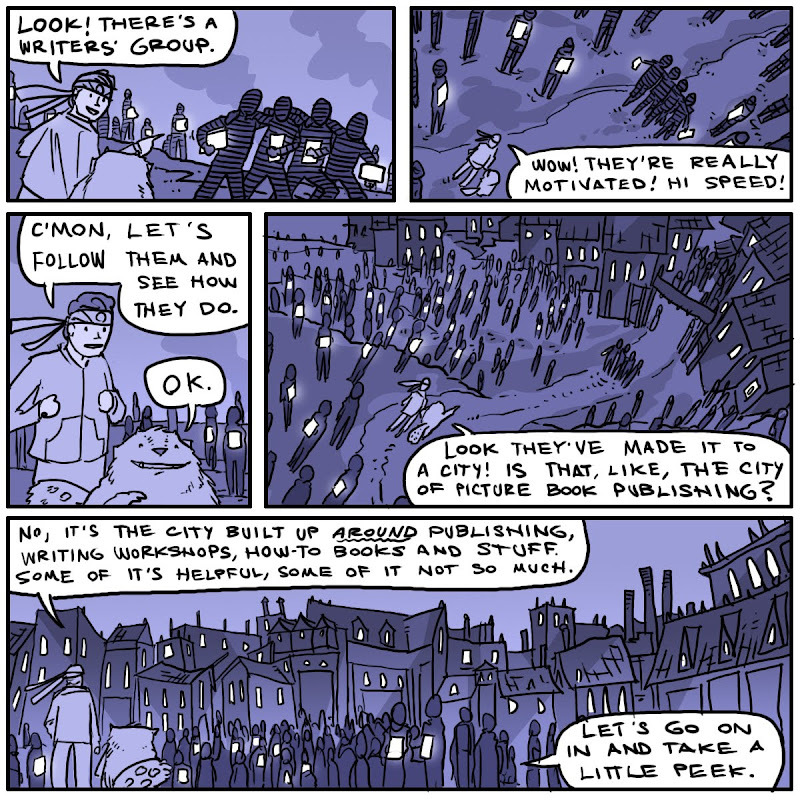 I'm seriously loving this "Land of Publishing" thing. And cavemen are fun, too. Even if they did not pervade my childhood. Which probably makes you right. Katya--Thanks for the info. I didn't even know there was info on Google reader subscribers. Neat! Debbie--Thanks, the Land of Doom will get more interesting as we go. There's some weird stuff to come. Abby--Yup, THE #50. Although it looks like I bumped to 52 overnight! Hooray! "Caveman from space who solves crimes" may be the best concept ever penned. I, for one, am jealous. Voila. But I never pay attention to the stuff I'm "following" .. but I've had you on my Google Reader subscriber list for a couple months! Captain Caveman? Are you serious? so I just youtubed him. You didn't make him up after all. He was there in all his 1977 glory. I love that he costars with the Teen Angels. Something has changed in the superhero scene since then, I think. Keep these comics and story ideas coming. You are making the bleak month of February look so much brighter.